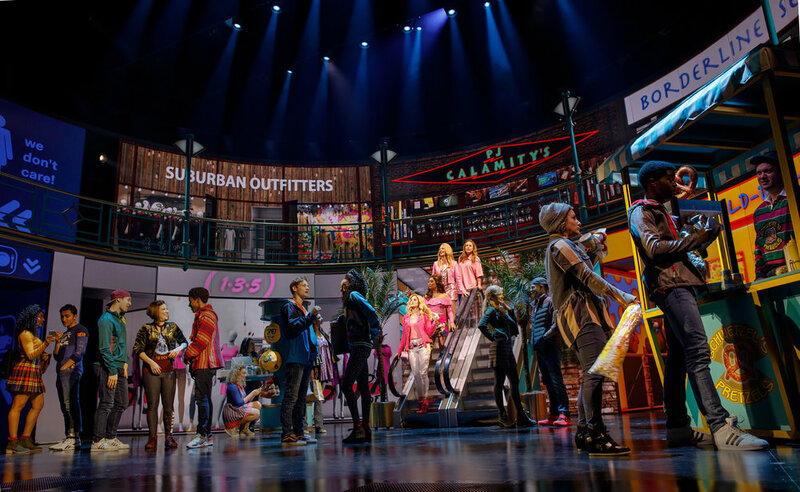 The much-anticipated new Broadway musical Mean Girls, based on the hit film, premiered at the August Wilson Theatre on Broadway. FRAY Studio worked closely with Director Casey Nicholaw and Set Designer Scott Pask to create a sophisticated, fast-paced and at times, surreal worlds of North Shore High's famous students. For the more surreal moments the video content represents the characters' psychology. Janis - the 'art freak' of the show: are drawn with markers, everything feels rough and unpolished. 'Queen Plastic' Regina video worlds' are pink and polished - when she's seeking her revenge it shifts into a 'Bond' inspired world which, while maintaining her colour, is less pretty, more stark and holds an aggressive energy. In all the musical numbers the video works along side the choreography, lighting design and live band in every number to a high level of precision giving the video design a life of its own as it take you through many different locations and reflects the vibrant attitude and wry humour of Tina Fays writing.